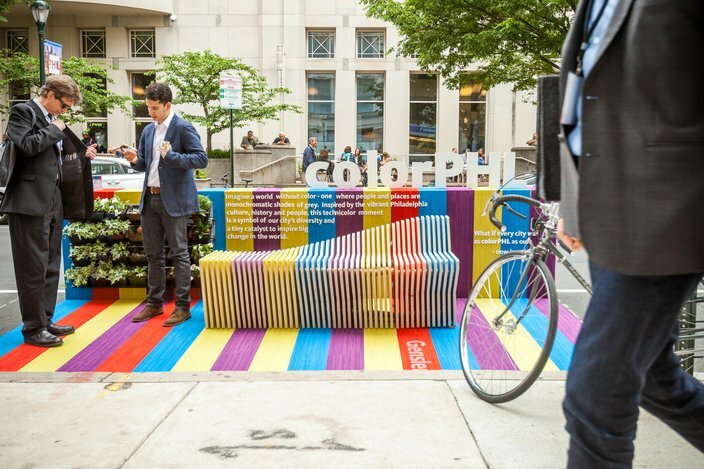 A parklet from Philly-based firm Stokes Architecture in conjunction with Open Streets and At Media, constructed for the AIA/Saint-Gobain Parklet Design Competition. Stokes and co. took home the jury competition's jury prize; that jury consisted of designers from Saint-Gobain and a wide array of AIA members. 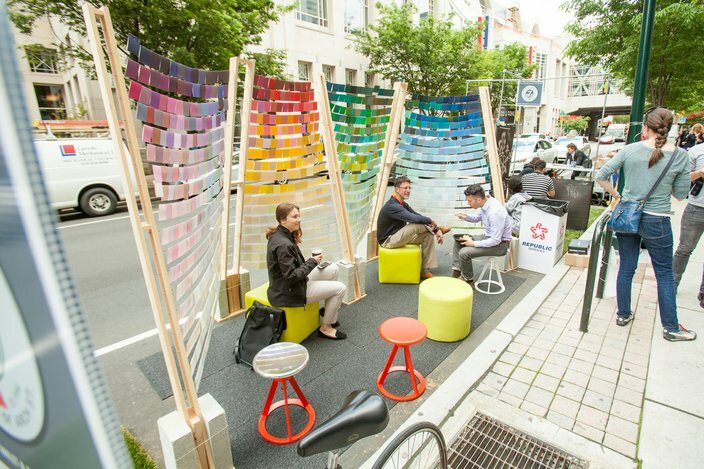 In the spirit of reimagining Philadelphia's streetscape, the American Institute of Architects and Saint-Gobain partnered to host the AIA Convention's first parklet design competition, the first round of which took place May 19, and continues May 20, from noon to 7 p.m at 12th and Arch streets. Parklets, for those unfamiliar, are modular mini-parks that take the place of a parking spot. In Philadelphia, they've largely been pioneered by the University City District, which has worked to bring them to restaurant-heavy blocks with heavy foot traffic. For the design competition, seven entrants — many of them local agencies or schools — competed for a cash prize of $1,250. Participants were given free reign with what they designed, though it had to be constructed with materials that cost less than $1,000 and, of course, fit into a 7-by-14-foot parking space. Saint-Gobain's parklet design, constructed as part of the AIA/Saint-Gobain Parklet Design Competition. Gensler, a firm based out of Center City, opted to use color as the bait to hook passersby. It also used recycled plywood to create a bench, made by Philadelphia University student and Gensler intern Alex Khlor. Center City architecture firm Grensler's parklet, constructed for the AIA/Saint-Gobain Parklet Design Competition. Built by: Jennifer Sharesky, Lana Tang and Alex Klohr. 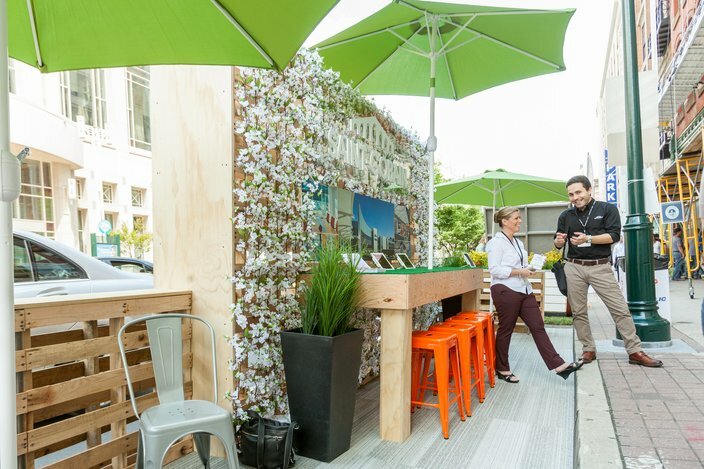 Gensler took home the People's Choice Award title for the most popular parklet of the seven; Stokes Architecture, in conjunction with Open Streets and At Media, took home the jury prize for their parklet (pictured in the lead image). Center City firm dMAS, meanwhile, opted to create a more interactive parklet, working with the Pennsylvania Historical Society to obtain a photocopy of William Penn's original grid map of Philadelphia. 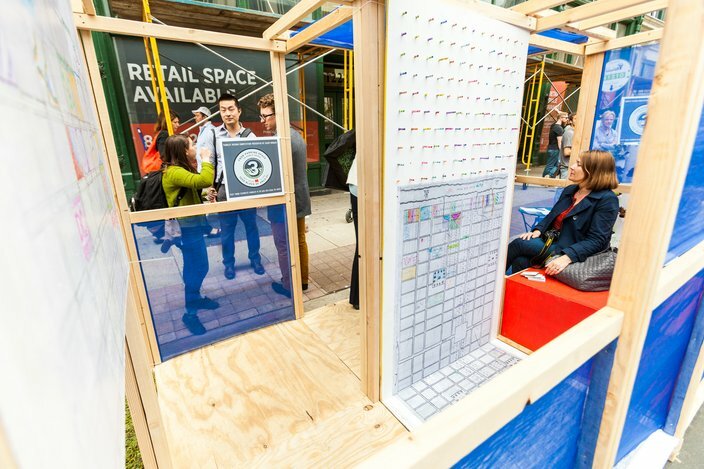 The parklet was constructed to riff off that grid concept; a sheet on the backside of the unit is situated just below a collection of crayons that people were encouraged to use to highlight some of their favorite blocks. Center City-based architecture firm dMAS Architecture's parklet, constructed for the AIA/Saint-Gobain Parklet Design Competition. "If you walk the same street [as someone else], you walk out with this different idea or perspective about it," Concetta Martone, principal of dMAS, told PhillyVoice. "We brought in this activity to find a street or place in the city you have experienced, and mark it with color and give it your own dimension. Old City-based architecture firm MGA Partners' parklet, constructed for the AIA/Saint-Gobain Parklet Design Competition. Those passing by were invited to sit and enjoy the parklets. On Thursday afternoon, a variety of people — many of them on lunch breaks — could be seen chatting with each other or reading in the parklet seating areas, which tend to be the focal point of parklet designs. 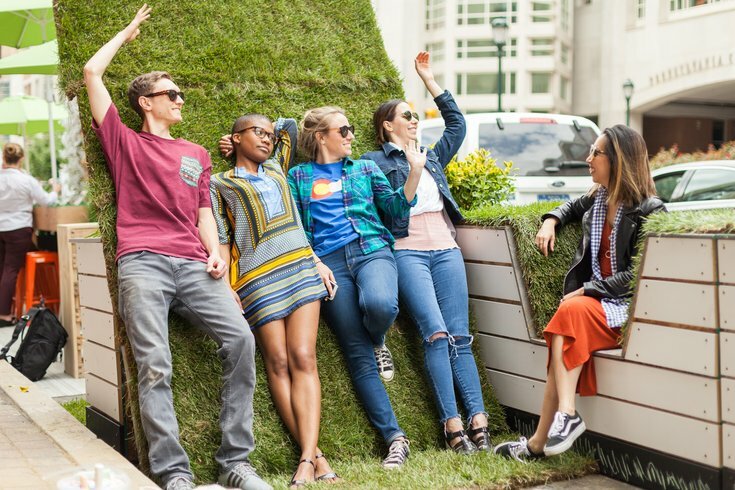 Fortunately, if you missed May 19's round of parklets, it's not too late to see what the competition has to offer and participate in the process: From noon to 7 p.m. on Friday, May 20, seven more designs will dot Arch Street, just outside of the Pennsylvania Convention Center and the Center / Architecture + Design. Onlookers are encouraged to vote through social media for their favorite design. Plus, Saint-Gobain's handing out free pretzels. So, if nothing else, pop by for that.